Contact us, we're glad to help you find the perfect entertainment for your event. Breakfast with Santa was a success again this year... It was a breeze to work with you guys and I'm looking forward to it again next year. Thank you for all of your artist's time, energy and effort during the CSO Children's Concert... Children and parents alike thoroughly enjoyed the entire event... amazed by all that was going on. Tammy and Nicki were absolutely fabulous... their attitudes and way with the kids is just the best... I will definitely recommend you all to anyone and everyone I can. I loved that the children were entertained, surprised and educated. We thoroughly enjoyed having you entertain at our Chick-fil-A School Nights... You're great at what you do. ... we were very pleased and would use your services again. I would recommend Bill Packard's Magic Man and Tammy to anybody. I plan on using you guys again for our next Fall Festival. Is always a pleasure doing business with you, and the kids are always very happy and they talk about Jonn's birthdays for months. Bill Packard and the Seven Wonders of the World Magic Show... had something for everyone. It was good & very much worth the price. Everything was fun & interactive. A real treat! Bill was very inspiring.... unique in that he incorporated science and social studies through fun activities. ... one of the best programs I have seen this summer. Of all the programs I've had this summer, this is the one that PARENTS & children (not just kids) raved about. ... very professional, detail oriented, self-sufficient and nice to work with. You went above and beyond the theme and the program was a great success. Maybe Bill should write an entire musical for Broadway! ... very entertaining and engaging. This program was the most appropriate for the theme that we have had thus far. ... very professional and prompt about all communications. The children thoroughly enjoyed it. The ladies did an excellent job, and we appreciate their professionalism and enthusiasm. I received many excellent comments from the parents after the show. ... educational and entertaining, featuring a variety of formats. ... mix of comedy with education is a real winner. ... lot of interesting information in a fun format! You did a great job with the whole show. The students were engaged, and content was applicable to the curriculum. ... inspired even the most misbehaved kids to listen and participate. Your company was awesome!... We would love to have you guys again. We work with top notch performers in Atlanta, Georgia, and throughout the Southeast! Magic is one of the most versatile forms of entertainment available. Presented in many different styles and formats, magicians fit in with just about any venue and theme. Perfect for receptions, cocktail parties, hospitality suites, and restaurants. Working out of pocket or from a small briefcase, the entertainer performs magical effects using small items such as cards, coins, rope, and borrowed items as he moves among the guests to entertain a few people at a time. Great for "breaking the ice" as they socialize, or at their tables as they wait for their meal. This type of magic show is presented in an organized format in a stationary location, usually working from a stand up or sit down table. Close-up shows are an excellent choice for birthday parties, fund raisers, dinner parties, family get-togethers, wedding parties, trade shows and other social gatherings as a memorable highlight of the event. Comedy magic is perfect for entertaining a group of young or mature party-goers, as the hilarity and audience partipation amuse and captivate the very young, and the magical effects and sleight of hand amaze and impress the older children and adults. This being an intimate event, it is easy to bring extra attention to the birthday child (even a shy one), the host, or company representative. Just the thing for small business gatherings, night clubs, schools, libraries, social organizations, and trade shows. Developed for larger audience, these shows require props that are big enough for everyone to see, a PA system so everyone can hear, amazing magical effects that people of all ages can appreciate, and the use of audience volunteers to encourage interaction among family, friends, co-workers, or prospects. The content is often customized to fit a theme or a message. An organized magic show can top off a company dinner, provide a change of pace at a business meeting, or offer a pleasant distraction for spouses and children. Designed for large rooms, such as banquet halls, theaters, and gymnasiums, these shows typically include a backdrop, a professional sound system, music, special effects, lighting, and large illusions involving volunteers (such as CEO, company representative, or host) and/or professional assistants. Yes, you could get a friend or a young teen to volunteer for your event if you only expect mediocre results. For the best, our face painters are talented, personable, entertaining, and experienced! 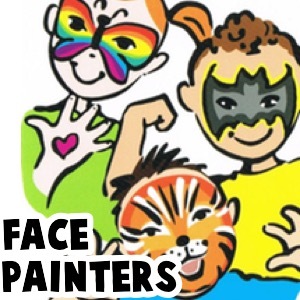 We can paint everyone's face - kids and adults alike! If the party is small, the guests can come back to get their arms and hands decorated, too. Or hire one of our multi-talented artists who can also twist balloons. Face painting is a great activity to enhance the atmosphere at a festive event and because it is very popular, you may want to hire multiple artists to keep your guests who are waiting their turn from missing out on the rest of the festivities. Show your appreciation to your clients and staff at a company picnic, or promote your business to family audiences at a festival or trade show by attracting attention to your booth. Sell tickets in exchange for face painting or attract an audience to your fundraising event by simply promoting that face painting will be one of the activities included. The kids can get their faces painted while waiting for their food, and the added attraction gives their parents a chance to enjoy each other's company! Balloon twisting brings out the kid in everyone! The colors, the excitement, and the animation will captivate your guests, young and old alike. They'll love watching animals, ninja outfits, wild and crazy hats, and more being created and given to them. Our twisters make them quickly and efficiently. While your guests are waiting they will be entertained enjoying the performer interacting with everybody. We generally twist sculptures that are both quick to make (1-2 minutes) and detailed enough to impress those who are watching. Plan to give the twister enough time to make a quick sculpture for each child and a big multiple-balloon sculpture for each host. If it's a small party, hire one of our multi-talented artists who can do face painting as well. Balloon hats and other sculptures create a festive atmosphere for large crowds. Treat your guests with their custom sculptures made on the spot. While waiting their turn, your guests will enjoy the jokes, antics, and the creativity of the performer. For large events, plan on the twister often staying after your event is over, because many people will insist on staying to get a balloon before they leave. Easier still, hire multiple artists including face painters. Balloon twisting always creates a crowd. Attract kids, families, and onlookers to your booth at a festival or trade show. Business cards or coupons can be attached to each sculpture as they are given away. Attract a greater attendance by promoting that balloon-twisters will be giving away their sculptures to everyone who wants one. 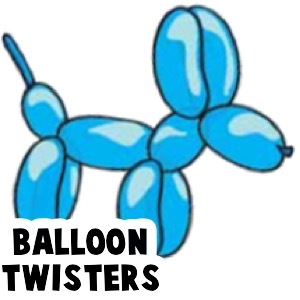 Balloon twisting is perfect for kid-friendly, fun restaurants for Kids Nights, Spirit Nights, etc, to attract greater attendance and to thank your regulars for their patronage. The key is to advertise ahead of time, with posters and table tents. We can help with the design if you would like. Caricature artists create beautiful, customized drawings in a matter of minutes. 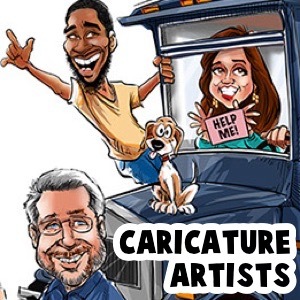 Any social event where adults and familes are having a good time, such as cocktail parties, pub crawls, wedding receptions, engagement dinners, company picnics, late night graduation parties, college events, etc is a good fit for caricatures. Perfect to bring attention to your trade show booth. Kids are enthralled, adults are entertained, and everyone leaves with a caricature as a party favor or promotional piece. Get the picture? All the world loves a clown! Over the years, there have been many types of clowns. Today, the term usually refers to characters with outlandish costumes featuring distinctive makeup, colourful wigs, exaggerated footwear, and colorful clothing, that perform some sort of fun activity, such as silly magic, slapstick comedy, face-painting, balloon twisting, singing, juggling, unicycling, puppetry, bubbles, or games. 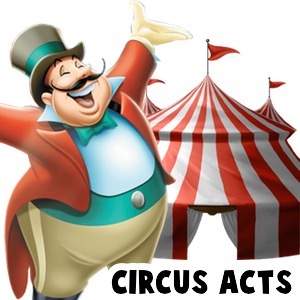 Of course, one doesn't need to be in clown attire to be skilled in these activities, but if the "look" is important to you (such as for a circus-themed party, parade, or festival), we can set you up with some fine performers in this category. 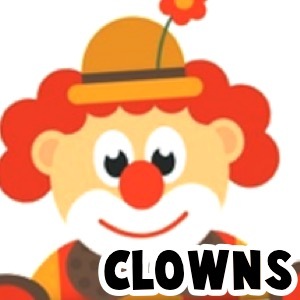 Because small children can be frightened by seeing a clown in full makeup, we recommend clowns with minimal makeup and more conservative (but colorful) attire for up-close events such as birthday parties. ...to your next luncheon, holiday party, festival, sporting event, Bar/Bat Mitzvah, or trade show booth. 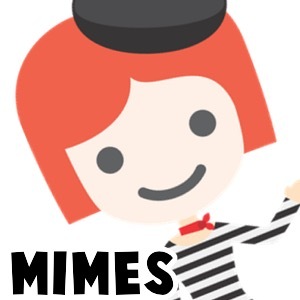 From traditional white-faced mimes in black and white costumes, to more contemporary acts (such as Living Statues or Robots), mimes can easily interact with audiences of all ages and nationalities, and no microphone needed! Treat your guests to impressive silent displays of hilarious physical comedy and bring fun and laughter to your event! Providing a fun visual spectacle that appeals to audiences of all ages and nationalities. 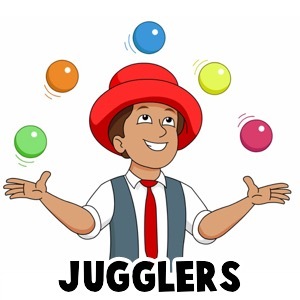 Whether they're juggling scarves, balls, bowling pins, or fire, professional jugglers provide an interactive experience at birthday parties, festivals, wedding receptions, family fun days, and corporate events. They can mingle with the guests to provide a festive atmosphere, entertain people who are waiting in lines, perform shows for large audiences, or present circus skill workshops for those who would like to try it themselves. ...which can involve music, puppets, multiple tellers, props, improvisation, and more. Likewise, each storytelling event is a little different. 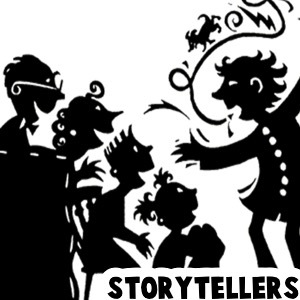 Storytellers interact at various levels with the audience, and storytelling audiences that "get into" stories are really fun. We'll need to know the theme of the event, the type and size of audience, and the physical environment, so that we can recommend StoryTellers who can customize their material and their approach to best meet your needs. Children and family audiences are naturally attracted to puppets. So puppet shows are great for birthday parties, childcare centers, arts festivals, museums, camps, and celebration of all kinds. Puppet shows that are creatively educational as well as entertaining are appropriate for preschool and kindergarten in-house field trips, school assemblies, summer library programs, and churches. 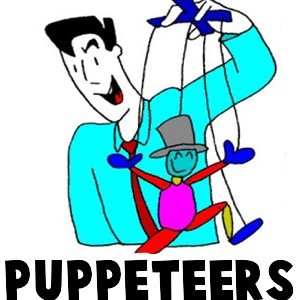 A puppeteer or ventriloquist can perform a theatrical stage show, or stroll among the attendees with interactive comedy. Puppet workshops are also quite popular... your guests make their very own puppet to keep. Add your logo and you have a great and memorable promotional item. Standing high above the crowd, stilt walkers offer versatile entertainment to turn heads at private parties, themed functions, festivals, parades, and promotional events. Many stiltwalkers are also jugglers, adding even more excitement and visual fun to your events. The amazingly detailed and unique costumes can be modified to fit your event's theme and are looked up to by people of all ages and nationalities. Try to give them a high-five, it's the height of comedy. See what I did there? 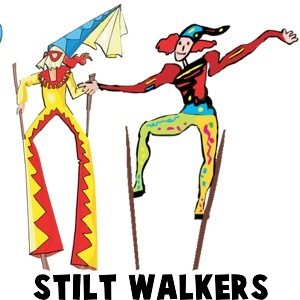 Stilt walkers add to the atmosphere and sense of occasion to any event. They provide guests with a wonderful photo opportunity, encouraging your attendees to post about their adventure and your event on social media. ...by a costumed performer who has knowledge of the character he or she portrays and is skilled in acting and improvisation. 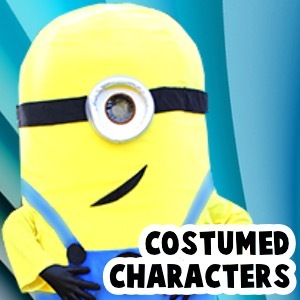 Depending on the character, they are appropriate for ANY event, as they can interact, play games, do workshops, perform shows, MC, or provide additional activities such as face painting or martial arts demonstrations. > CLICK HERE for further details! We have over 40 Atlanta-area Santa impersonators on our roster. Simply tell us the details about your event, and we'll send you photos, bios, and rates for those who are available. 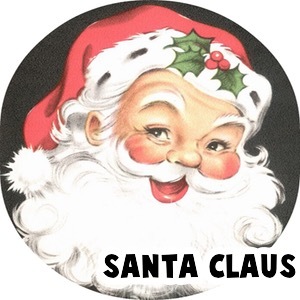 It's amazing how far ahead Santas are booked, so contact us now to reserve Santa for your Christmas event! Children are natural musicians, they love it! 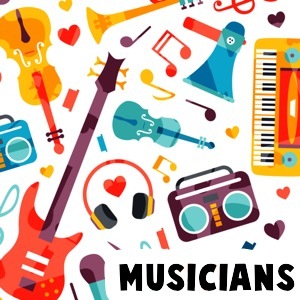 The musicians in our roster are interactive, high energy, and fun. As variety art performers, they provide entertainment for small to large gatherings of children, family, or adult audiences who like to clap, move their bodies, sing along, and laugh. Many provide educational content and hands-on participation, appropriate for school assemblies, daycare centers, arts festivals, etc. Circus Acts can be combined and customized to suit your event, big or small. Contact us for details, we'll get your personalized circus pulling into your event! 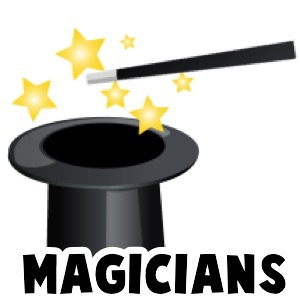 About Magic Man Entertainment Your source for quality family entertainment that fits within your budget. Family run, over 25 years in business. We do all the work for you!